For the past year and a half, I've been telling anyone who would listen about the importance of responsive design. Google defines responsive design as "an approach to web page creation that makes use of flexible layouts, flexible images and cascading style sheet media queries. The goal of responsive design is to build web pages that detect the visitor's screen size and orientation and change the layout accordingly." With 60 percent of all Internet access now coming from tablets and smart phones (source), the importance of a website that performs well on these devices cannot be overstated. 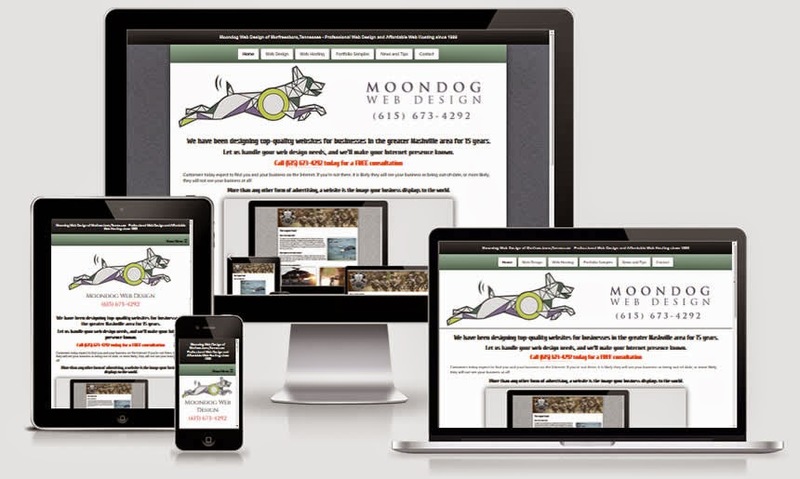 Now I have finally taken my own advice and completely redesigned the Moondog Web Design website. In addition to having a new logo, layout, and color scheme, the updated design is now responsive and passes the Google Developers Mobile-Friendly Test. Not only is the new design easy to browse on just about any device you can imagine, but thanks to the new “mobile-friendly” designation that Google is rolling out for responsive websites, I can expect a to see a boost in my search engine rankings as well. If you are interested in a new responsive website for your business, or if you have a website in need of a responsive conversion, give me a call at (615) 673-4292, and I will be happy to discuss your options.